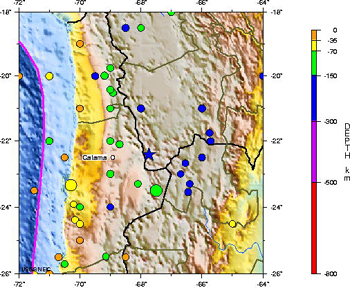 A magnitude-6.9 earthquake rumbled through Bolivia and northern Chile yesterday. No immediate deaths or damage were reported, according to Reuters, although people evacuated their homes. Still, people felt the earthquake over hundreds of kilometers, as the waves of the 162.5-kilometer-deep earthquake dissipated while traveling through the planet's crust. This map of the Potosi region of Bolivia shows all magnitude-7 and greater earthquakes since 1900, including a magnitude-6.9 temblor that struck yesterday (marked by a blue star), at a depth of about 160 kilometers. Image courtesy of the U.S. Geological Survey. The earthquake was centered 110 kilometers (70 miles) east of Calama, Chile, in the Potosi region of Bolivia. The region's residents are used to feeling earthquakes: Western South America straddles the subduction zone where the Pacific plate dives beneath the South American continent. The immense Andes mountain chain is a product of this meeting of the plates; the Pacific plate plunges down hundreds of kilometers beneath the mountains, deforming as it travels deeper into Earth's mantle. That deformation produces large earthquakes at extreme depths within the plate itself, some as deep as 500 kilometers or more. But the biggest earthquakes in the region occur when an earthquake originates from interactions between the two plates, as happened in 1960, when a magnitude-9.5 Chilean earthquake  the largest earthquake ever recorded  set off a massive tsunami and killed thousands of people. Reuters news alert, Nov. 17, 2005.